Featured image: Young man at the Gaza border fence, in the documentary Killing Gaza, by Max Blumenthal and Dan Cohen. After he visited Gaza in 2009 investigating the recent Israeli onslaught, Judge Richard Goldstone had nightmares, and he tried to communicate some of that trauma to readers of his famous U.N. human rights report. He did that by appending many personal stories from Palestinians who had survived violence. I remember the youth who calmly described a missile “truncating” his legs as he and others huddled in a shelter across from a UN school. I remember the young boys who told of being forced terrified into a bombed out house as human shields. The 2014 assault on Gaza – Operation Protective Edge – was far more devastating than Cast Lead of ’08-’09, but till now, no reports of individuals’ experiences have approached Goldstone’s standard. 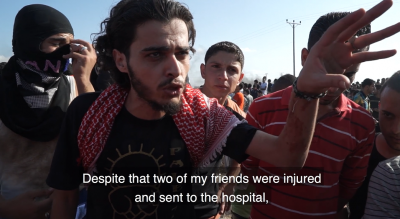 That is the power of “Killing Gaza,” the haunting new documentary by Max Blumenthal and Dan Cohen. It offers a series of intimate portraits of Palestinians who witnessed hellish events during the seven-week attack. These people tell their stories with clinical detail, surprising restraint, and the poetics of the sufferering; and the effect on the viewer is scarring. No dispassionate person can watch “Killing Gaza” without being crumpled by the echoes of persecution. And if the documentary is showing only one side of the conflict, it hardly matters, because the filmmakers are transparent about their one-sidedness and we know the statistics: more than 2200 Palestinians killed, including 500 children, while some 67 Israeli soldiers were killed, and a half dozen civilians. Israeli missiles destroyed so many buildings that 100,000 people (more than 5 percent of the population) was left homeless. This was a one-sided conflict. Ali Ahmed Qudeh, in Khuza’a, from the documentary Killing Gaza. The heart of the documentary is a speech by Ali Ahmed Qudeh in Khuza’a, a town bordering Israel east of Khan Younis that was all but demolished by Israel. Qudeh is gratified to learn that American journalists have arrived and explains that he has lost two sons in the onslaught, and then directs the cameras toward his grandchildren. One day this boy will make an atomic bomb in his house to wipe out Israel. How do we lift the hatred and anger from the hearts of these children? How do we remove it? How do we teach them to feel joy again? Why don’t you kill them all with missiles? We aren’t terrorists. We’re a civilized people. He goes on to detail America’s role in the onslaught, in supplying Israel with weapons and diplomatic support. You think they want a loaf of bread from America? Ask them! [He turns to his grandson] Do you want balloons from Obama? No! I leave it to God to deal with all who wrong the Palestinian people. Just look at Qudeh’s face: the intelligence, passion and need to be understood. The wonder of this moment is that a humble man in devastated surroundings delivers profound political and spiritual insights with far greater eloquence than any of our leaders have re Palestine. As Isaac Bashevis Singer once said, a poor nobody walking down the street is a millionaire when it comes to emotions. Or there is the glamorous young man at violent border demonstrations (in the screenshot that tops this post) who explains why young men demonstrating at the border fence take such incredible risks in the face of Israeli guns. Blood is the way to fight, so as to liberate our land. We are manifesting our choice. We are defending a belief in a stolen homeland. The protester’s speech is a reminder of the fact that Palestine is thoroughly politicized, and its youth are sophisticated political actors, who are generating consequences today in Israel’s growing isolation. And he reminds us that Palestinian dispossession cannot be answered, as it has been for 70 years, with more force. Many images in the documentary are searing. A young man is hoist through the air by a cable and winch to the top of a ruined 10-story building because the stairs have been bombed out. Five hyenas in a zoo in which 85 percent of the animals have been killed circle madly and endlessly, evidently having lost their minds due to bombing and starvation. Or there is the Israeli army video of the soldier calmly anticipating the demolition of the mosque in Khuza’a, moments away on the bombing schedule, which he dedicates to the memory of three comrades. The soldier’s lack of concern for the victims is chilling. I was reminded of Judge Goldstone’s epiphany when he saw images of the massive Star of David that Israeli tanks carved in fields in Gaza in ’09; as he later explained to a Zionist who attacked him at Yale, the sight deeply disturbed him. Some of the most effective imagery in “Killing Gaza” is not video, but the drawings of traumatic scenes. Because the filmmakers did not have video of several incidents that Gazans describe to them — for instance, the death of a girl in a wheelchair whom her family has no choice but to abandon as they flee violence, or the killings of paramedics trying to rescue a wounded man tied to a tree — they commissioned art by Khloaris. The renderings are charged with stillness, dignity and terror that rise above the actuality of video. I recalled John Ging of UNRWA telling my group when it visited Gaza in ’09, The Palestinians are a deeply civilized people. Khloaris image of ambulance drivers seeking to rescue wounded man tied to a tree, at night, Gaza 2014, from movie Killing Gaza. It has been four years since the events of “Killing Gaza,” and the slaughter has been eclipsed by the indiscriminate Israeli shooting on the border of the last few weeks, in which 4116 have been injured by live ammunition (! ), and over 140 killed. So, Protective Edge feels a long time ago, but the lessons of “Killing Gaza” are fresh. Violence delivered on the scale of the Israeli onslaught will never resolve the political and justice issues at the heart of the conflict. It only prolongs the suffering. Famously, 20-year-old Salem Shamaly was killed in Shejayia on July 20, 2014, perhaps the most documented assassination in Palestinian history; and Blumenthal and Cohen feature a desolating interview with Salem’s younger brother Wassin who confesses that he is so depressed by his brother’s absence, even a year later, that he barely shows his face at festive events. He visits his brother’s grave every Friday and wishes to join him. From the time of its birth, Israel’s leaders have believed that if they caused enough violence the Palestinian problem would go away, or at least be kept at a distance, subject to the occasional two month long war– variations on the famous iron wall doctrine. This film shows us the spiritual dead-end of such thinking.